It's still delicious. 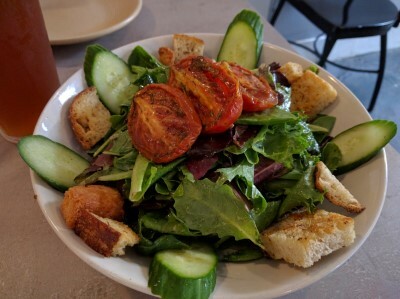 Crisp greens & cucumber, roasted tomato, croutons. But I think it used to also have pork belly. It wasn't listed on the menu description. I kind of missed it. 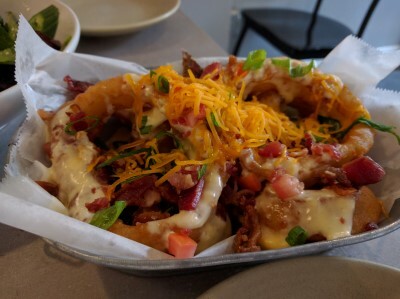 We shared a daily special appetizer of Fried Onions Rings covered with cheddar cheese, diced tomatoes, bakn aioli, and scallions. This was disturbingly delicious. I couldn't stop eating it. Onions, like garlic & shallot, bother me and I need to be careful. It was difficult to be careful. I said I'd only eat one ring, but I think I ate 3 and then shoved the basket at SP and told him that if he didn't finish it, he at least had to keep me away from it. Instead of a "meal," SP chose another special dish that I think was meant to be just an appetizer. I don't totally remember it, but I think there was ham, kielbasa, sauerkraut, bacon aioli/mayo. He said it was delicious (but not a super healthy choice!). I guess that's why we ordered that big salad - to make up for the bacon, ham, and bacon mayo! 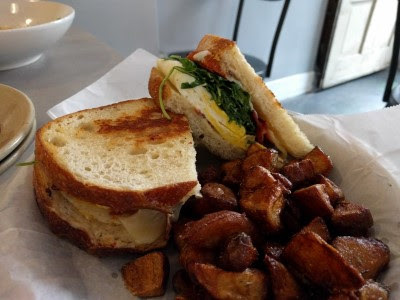 I couldn't resist my favorite Breakfast Sandwich #1 (Fried Egg, Peppered Bakn, Jarlsberg Cheese, Oven Roasted Tomato, Arugula, Baknaise on Sourdough). I think the bread was different, not sourdough. The potatoes are different. I'm pretty sure they used to be sliced, not cubes, but I like them better now. The sandwich is still a glorious, drippy mess of deliciousness. We were surprised that around 5:30 on a Saturday we were the only people in Bakn. By the time we left a few other tables were occupied, but it wasn't nearly as crowded as it has been in the past. This makes me sad because we really like Bakn and hope it does well and sticks around for a good long while. 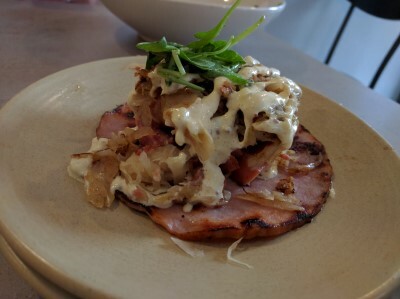 We always enjoy our food and our server is always fantastic.